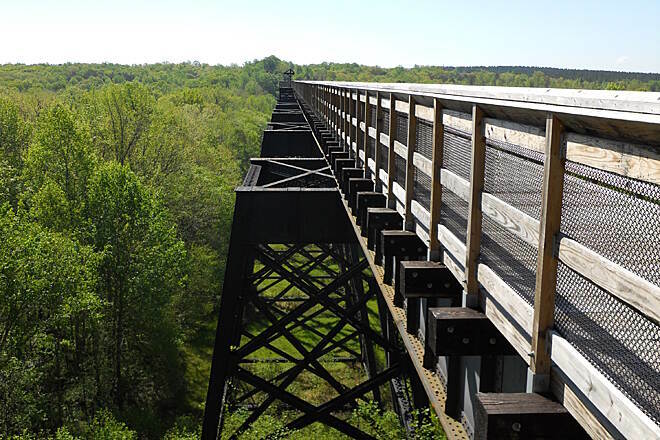 The central feature for which the High Bridge Trail is named is an unforgettable experience, towering 125 feet above the mighty Appomattox River and nearly a half-mile (2,440 feet) across it. 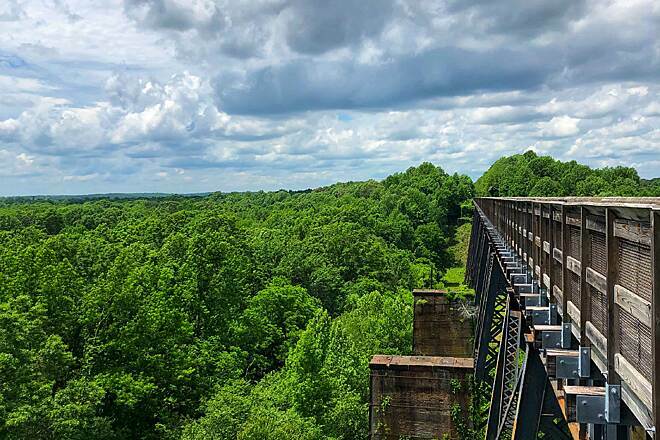 The bridge’s breathtaking view of the surrounding Central Virginia countryside, combined with the ease of getting here—the trail is only about an hour’s drive from both Lynchburg and Richmond—make it a must-see destination. 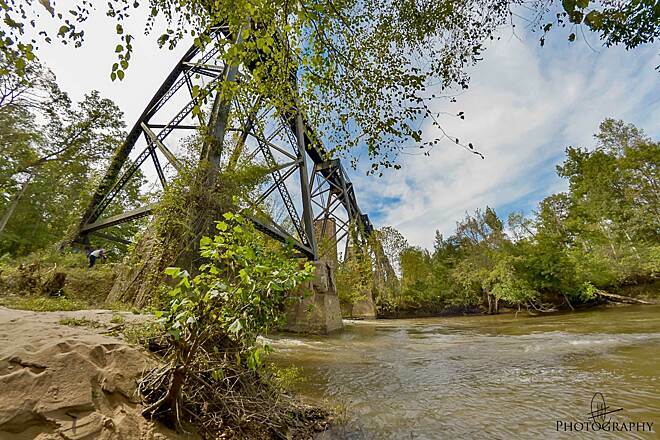 During the Civil War, the bridge—now included on the National Register of Historic Places—was a strategic point for both Union and Confederate soldiers; both armies made attempts to destroy it to prevent the other side from crossing the river. About a dozen miles from the west end of the High Bridge Trail is the famed Appomattox Court House, where General Lee finally surrendered. 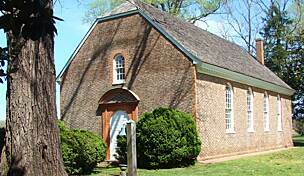 Several museums and other historical attractions in Appomattox make the town a worthwhile side trip. 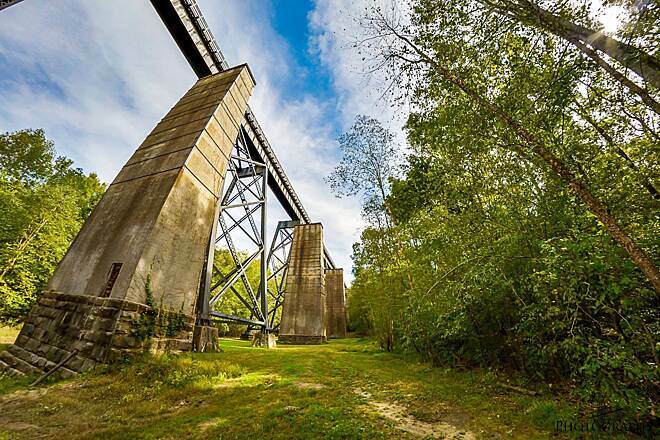 For the more adventurous, the rail-trail extends outward from either end of the bridge, totaling more than 30 miles through woodlands and rural farmland. The trail’s surface of finely crushed limestone is well-suited for hybrids and mountain bikes, and horseback riding is also permitted. Restrooms are available en route, but drinking water is not, so be sure to pack some. 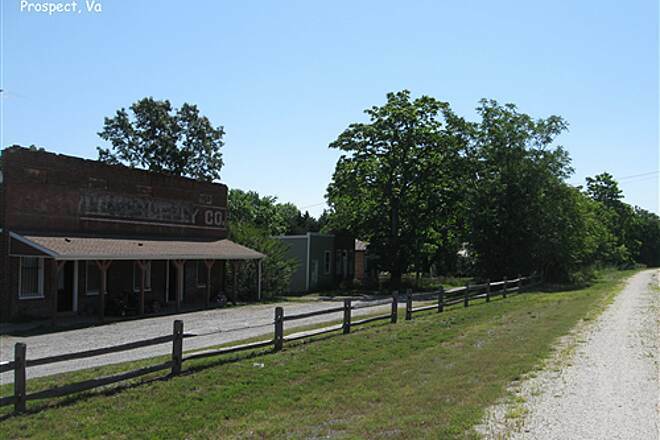 In addition to Farmville, the communities of Pamplin City, Prospect and Rice are also connected by the trail. Its eastern end lies just outside of Burkeville. 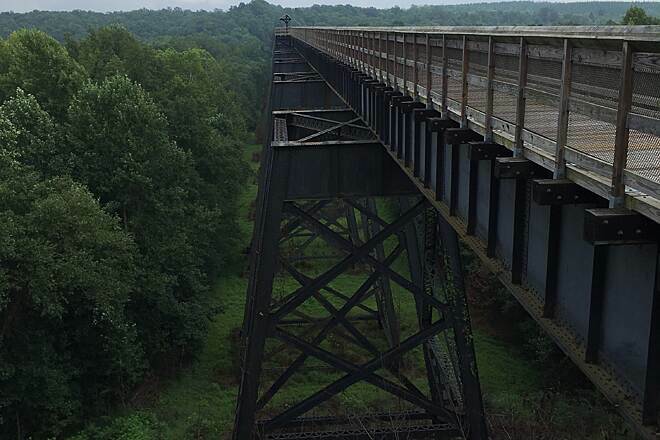 A friend and I took a break from driving to ride the High Bridge Trail east from Farmville to the bridge. The trail is decent crushed limestone, wide enough to ride 2 abreast. The scenery was the same until you get to the bridge, which is about a half-mile long. Great view from it. Photographing the bridge is a challenge, as hard to get a side view without walking a ways. I would consider relocating to Farmville for this one. Like most trails, it's many, many miles of stone, trees, and not much else to look at. But the crown jewels along the way include High Bridge (what a great view) and Farmville. 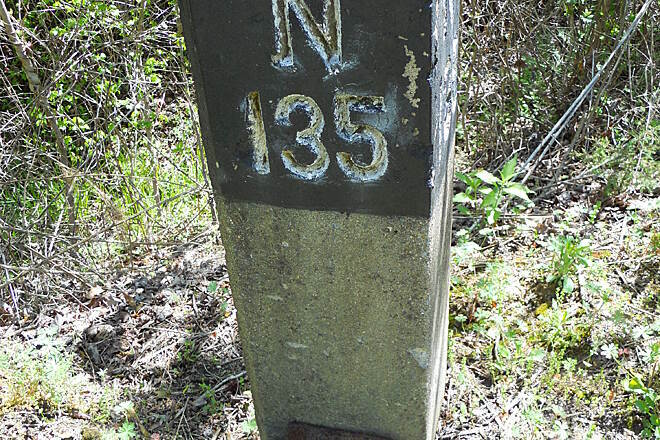 I also enjoyed the old railroad markers, spikes and remnants of the railroad which were neat to see along the way. The ride was a bit challenging, if you are like me and not used to long inclines or riding long distances on stone, then pace yourself. But the leg cramps afterwards were worth it. If you are riding alone, there are some long and lonely stretches. Not sure how much of it is patrolled, but I passed a park police officer also on a bike. My final word of caution, remember it's a stone base. I saw many people on road bikes riding 700x23s. I would recommend against that. Do yourself a favor and bring a hybrid with wider tires or a mountain bike. The trail is very well maintained the entire route. I rode it on a road bike and found it suitable. 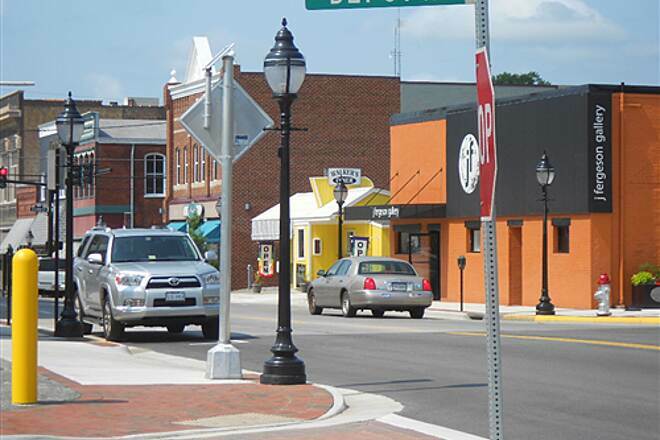 There is a free parking lot located in downtown Farmville where the trail crosses Main Street. Also real bathrooms and drinking fountains at this location. For those of you that might care: Farmville is the low point on the trail and the grade is upward in both directions to both trail ends. After reading the reviews on this site, I didn't think I would enjoy today's ride. I was pleasantly surprised. I parked at the Rice state park lot ($3) and initially rode east to Moran and back. 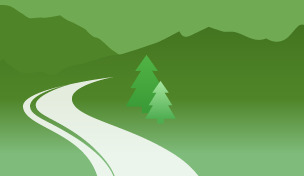 The trail is well maintained and free of debris and potholes. I think it's very interesting to see how the original train track was "built" into the land to provide for a nearly level surface. The surface is now fine, crushed rock providing for easy riding. There are clean bathrooms (but no water) and picnic tables every 4-5 miles. After returning to the Rice parking area, I continued west 3+ miles to the bridge. 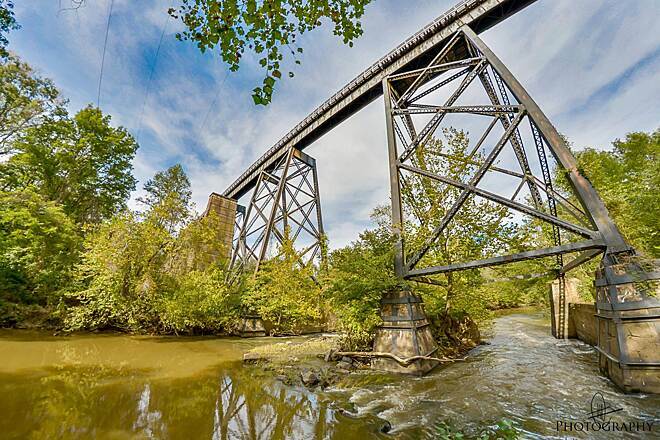 The bridge is an impressive work of engineering and offers picturesque views of the Appomattox River far below. The historical signs along the bridge are interesting and well done. I continued 10 miles further west passing thru Farmville and turning around at the Guttle parking area. On return, I stopped at Walkers Diner in Farmville and ordered a delicious lunch at the carry out window which I enjoyed on the bridge. I agree that the scenery on the trail is limitted. No mountain vistas here! 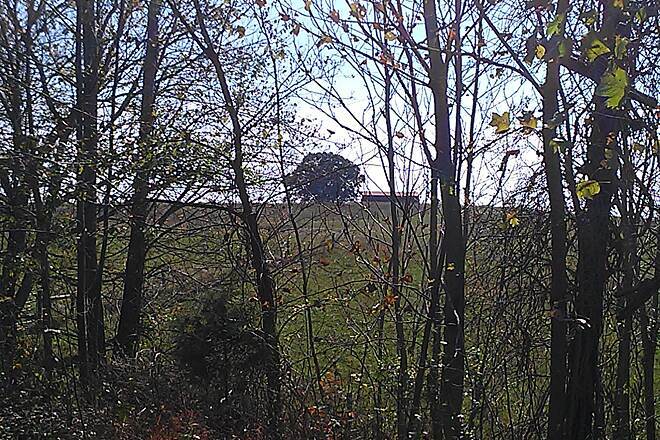 I did enjoy seeing the railroad markers and farms thru the trees. I spotted a large deer and lots of butterflies! Started in Pamplin end of the trail because that's the only place where there's an access at one end of the trail. So my review is coming from a bike rider who likes to do all of a trail when riding. Pretty much flat grade. There's elevation but it's hard to determine if you're climbing or going down because it's an old train rail system, there's no hills or slopes on this trail. Trail does have a good supply of restrooms (no water supply at these) and a few picnic tables along the way. Condition of trail gets a 9 out of 10 with only a few wet swampy areas (just west of Farmville). Mileage markers for complete trail is poor. Parking at the ends of the trail...poor to not even there at the Burkeville side. Cost of parking $6.00 per day. 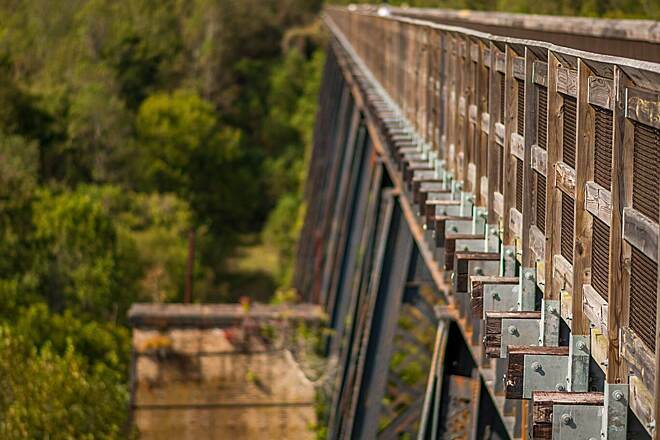 State more focused on the bridge than promoting the whole trail. Would I return for another ride? No. 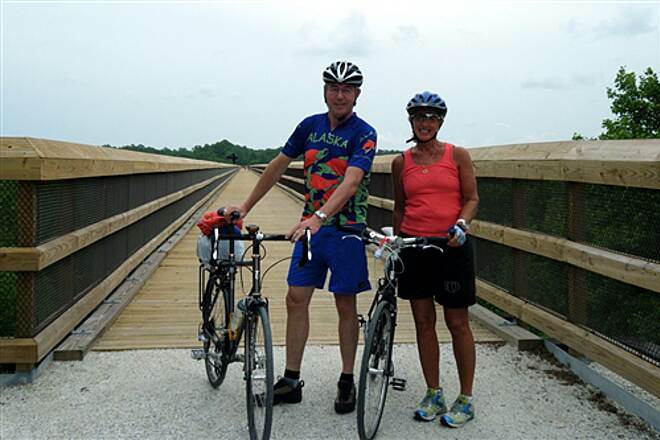 This trail is focused on the bridge 100% and has very little interests to provide a great trail to ride end to end. The state is really missing out on what could be a great trail and pull more bike riders to it, if they'd just fix the trail by setting up both ends with parking and put mileage markers that count from the end to the other end. I'm going to break this down in Pros, Cons and extra stuff. And why I'm rating it as a 3 and what I believe would help to make it a 5 on the rating scale. It's fairly flat, surface condition of the white stone is fairly smooth most of the way, only had 1 spot that horse shoes dug in pretty deep. Farmville is somewhat in the center of the trail so you have a nice breaking point for lunch or?? There are bathrooms every 2.5 to 5 miles but no running water at these. Poor overall trail setup, this trail isn't being designed from end to end but from the bridge as being ground zero. What mileage markers I saw, were designed around the bridge as zero and worked away in both directions. State staff need to realize, the bridge will sell itself, they need to focus on promoting the whole trail and not just the bridge! Poor parking at the ends, you can't even park at the Burkeville end of the trail because it doesn't go to Burkeville, it just stops in some weeds outside of town (very poor choice). 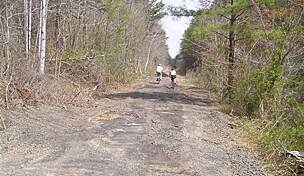 And Pamplin end is where they (state) decide to use it for gravel storage instead of making it a starting point for bikers/hikers. 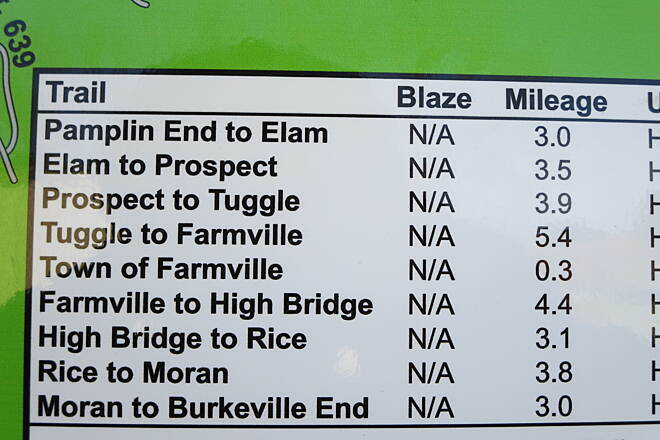 Trail mileage markers are only focused on the bridge area. I really don't care to know how far away from the bridge I am, I'd rather know how far I've traveled on the trail from one end to the other. Zero water stations and no pump stations at all on the trail. There is however a bike shop next to the trail in Farmville. I saw at least one parking area that was posted $6.00 per day on the weekends. Views on the trail will be a mix of trees and embankments because it's a train track. Best view is the bridge but I can only imagine what it's like during the Fall season, not sure you could get by all the people standing on the bridge who want to see the Fall colors on the trees. Would I go back? No, not unless they completely change how they have the trail designed and focus more on the end to end trips. 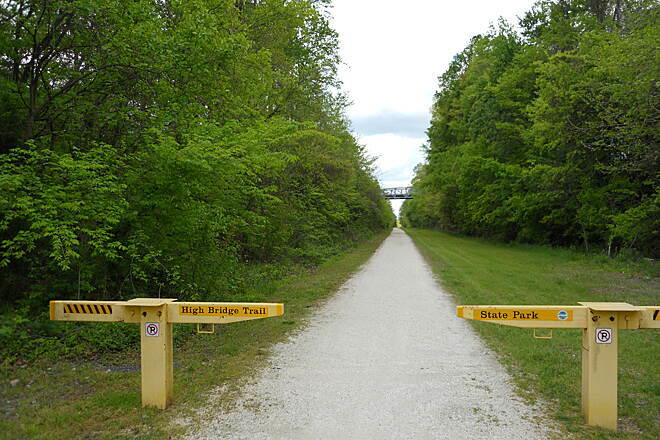 Extend the trail to Burkeville and put end to end mileage markers in place. Do that and I'll consider coming back on a regular basis. while your'e here, check this out! 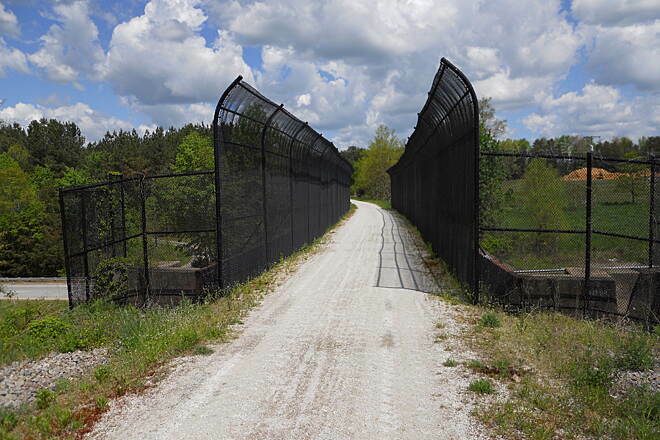 Nice trail for walking and biking, but if you're stopping in Farmville, PLEASE check out the Moton Museum on Griffin Blvd. I've been to Selma, Montgomery, and Birmingham, and this little museum tops them all! 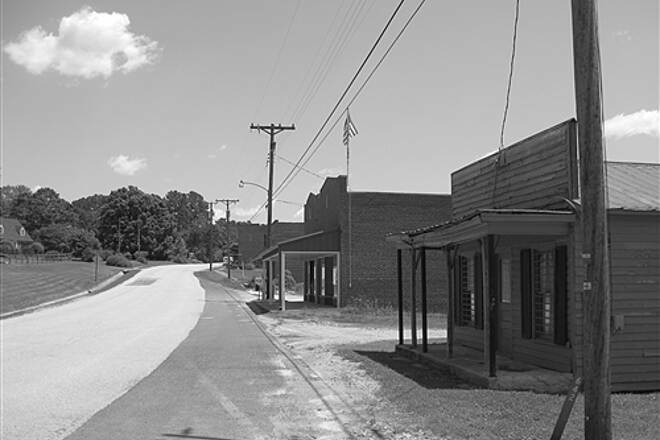 You'll learn so much you never knew about how involved this town was in the Civil Rights struggle. I spent 4 years at Longwood and never knew this stuff! Fascinating and very moving. 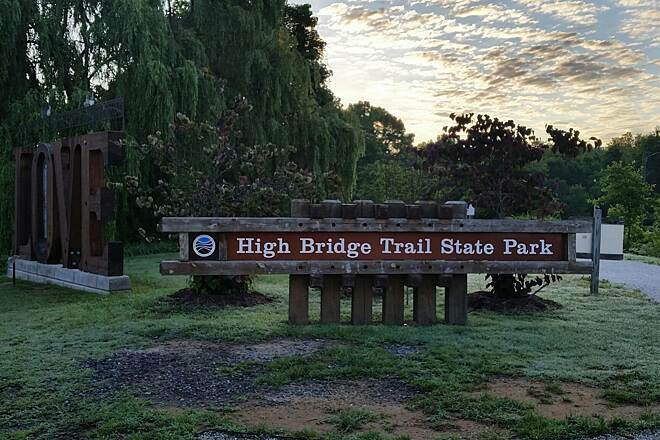 If you didn't know High Bridge SP has 2 loops single track designed for bikes. This is your heads up. The Early Trail is a 1.8 mile beginner loop. Nothing technical or difficult with serious flow. Novice riders will be challenged with the small climbs and curvy turns, a couple are fairly tight. Experienced riders will love speed and flow. You can really fly, but careful there are a couple twists that really need full attention and technic. The Burnside Technical Trail is rated Black Diamond for it's tight twists and aerobic climbs. It Packs 350' of climbing in 2.5 miles. The trail is built for flow and several sections will test your skills. The roller coaster sections are a blast. Wet crossings, banked turns, tight drop thrus and speed runs will make you smile. I like to hit Burnside first with the option to do laps and then finish with a fast lap thru Early. 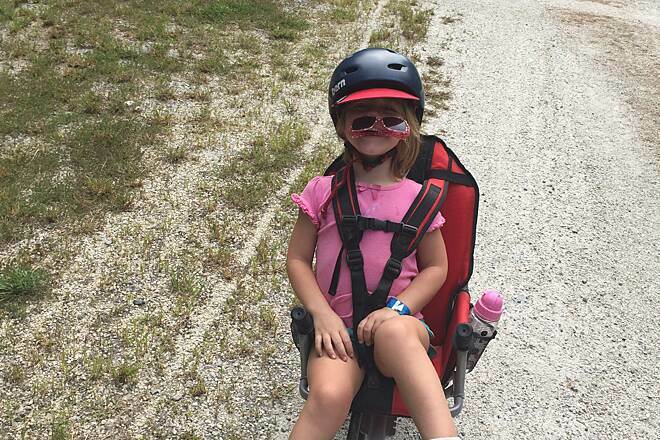 This is a great trail ride for the novice or younger cyclist. It's fairly flat and easy to ride. It's long enough that the more experienced rider can be challenged by riding its entire length. We actually parked in the lot that was only about 1 mile from the High Bridge since my husband was running while I rode. It's more like 4-5 miles to park in Farmville and ride to the Bridge. Just FYI - it does cost to park - so bring your $1 bills - we didn't know but were able to scrounge up the $3 parking fee. (self- monitored lot). 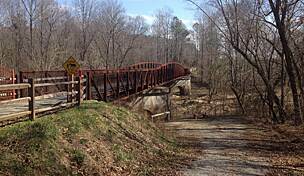 Really liked the trail a lot and will go back and plan to start in Farmville and go back to the Bridge. Great rest room facilities on the trail, too. I usually like to ride new trails from end to end, but on my first visit to High Bridge Trail State Park on an overcast and cool Saturday in early October, I decided to start in the trail's center point, the town of Farmville. I'm glad I did. Downtown offers municipal parking, coffee shops, diners and cafes, historic buildings, and the nicest public restroom I think I've ever seen (at the trail hub). I chose to ride east, heading straight towards the namesake bridge. Wow - what a view! 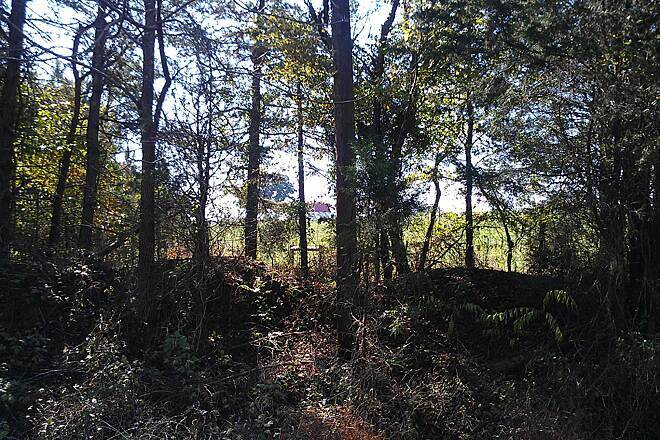 Just east of the bridge is a civil war era earthworks. While I didn't stop to check it out - it appears that Virginia State Parks is constructing something near the trail - perhaps a visitor's center / museum? 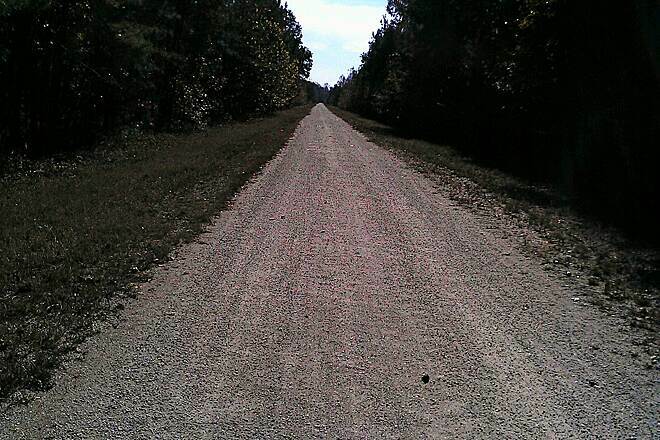 The trail is a well-maintained fine gravel surface. I'm not sure how regularly it's cleared, however I rode a mere week after Central Virginia experienced some very heavy rains - and I was pleasantly surprised with the conditions. 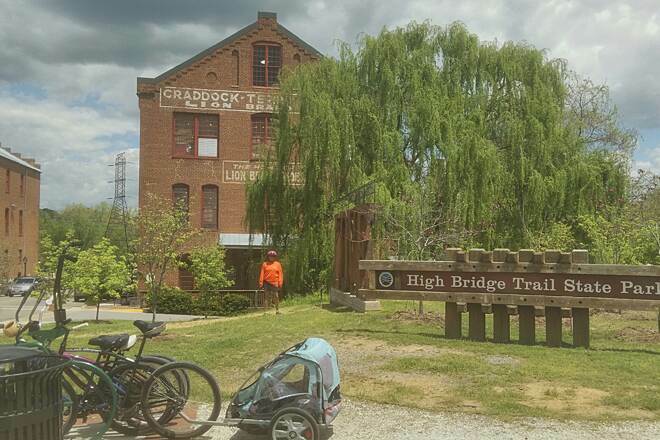 In contrast, a few weeks ago I rode the Tobacco Heritage Trail, which is NOT a state park / trail, and the difference was very noticeable - particularly with regard to debris removal and the too-soft surface condition of that gravel trail. 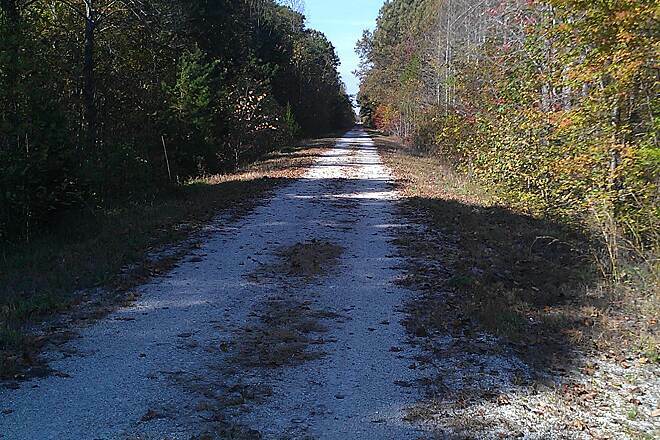 My trip only covered the eastern half of the trail, from Farmville east to milepost 135 near Burkeville. The east end of the trail is a bit of a disappointment. Although it was very quiet and serene (I saw two white tail deer on the trail), the end of the line lacks anything to distinguish itself. 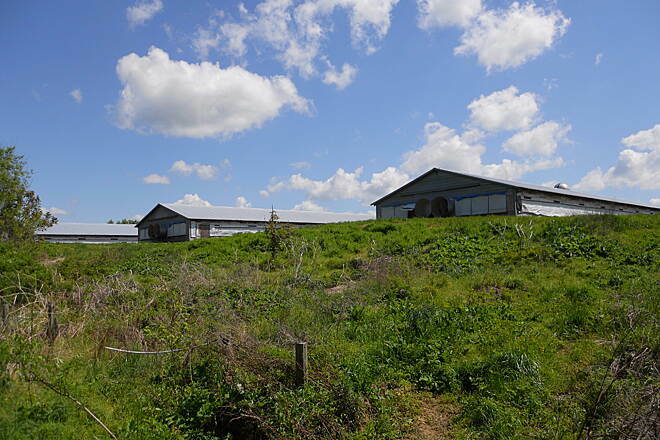 There is an offensive-smelling chicken farm near the eastern terminus - and the endpoint itself is unmarked and not a trailhead. Although it is close to US 460 (you can hear the nearby traffic), there is no access point - and the trail simply ends with overgrown shrubs, vines and trees blocking the middle of the right of way. There is a picnic table - but not a trash can - which unfortunately meant there was no place for the many beer cans and bottles I saw (I would have picked up a few and done my part to keep the trail clean). An improvement would be a slight extension to the town of Burkeville. 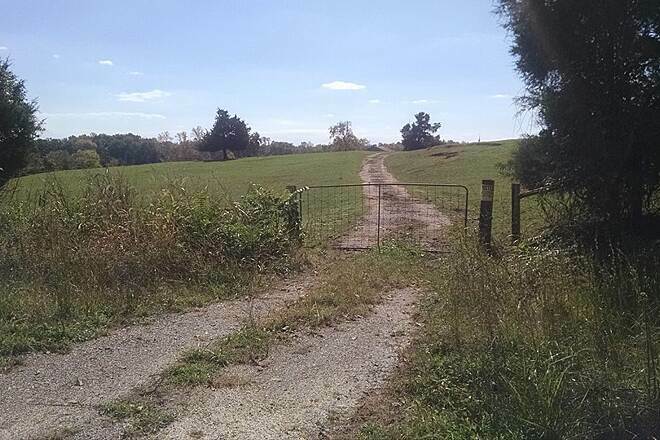 The addition of another trailhead would certainly draw more visitors from US 460. Overall the trail is a great experience. 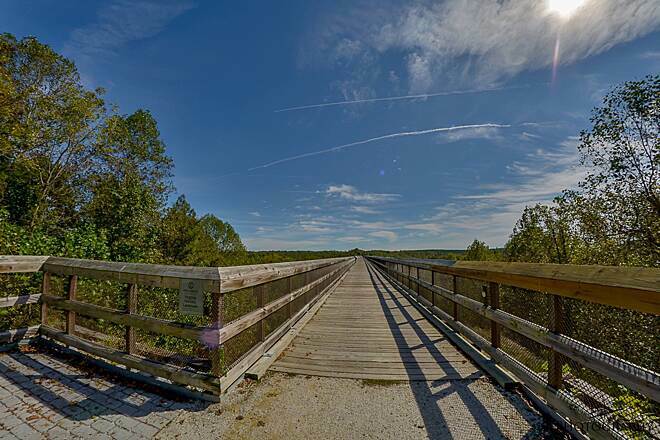 If you need to get away from it all - it is a quiet and remote trail the farther you go from Farmville and the namesake bridge. I'm looking forward to returning and riding on the western half. I am new to rail-trailing, so the fact that this review doesn't have a rating means nothing. This is only the second RtoT I've ridden so I have nothing, really, to compare it to. 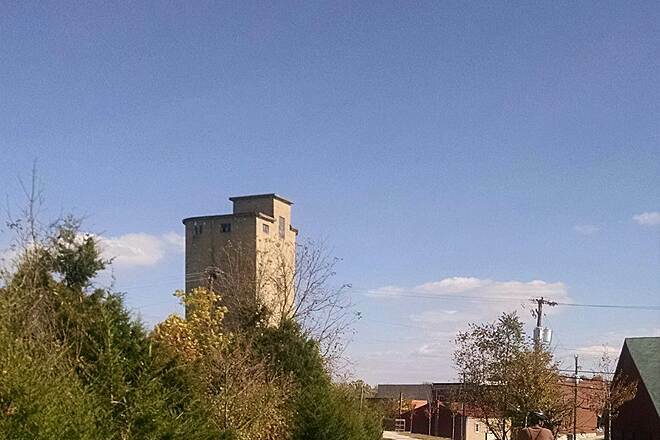 That said, I rode my bike from the Rice Depot to about a mile beyond Farmville on a Thursday. I saw only a handful of people. The trail surface is great for biking (crushed limestone, I believe I read somewhere) and it is well-maintained. I'd say most of the trail on that stretch, anyway, did not have shade. I had to pedal the entire stretch coming and going, but I was not tired (unlike the W&OD which I did a part of on Monday and that had my legs tired by the end). The trail on this stretch pretty much hews to running thru forest, with occasional views of houses and, of course, the highlight, the High Bridge. There are a few restrooms along the way, but the latrine kind. In Farmville, there is an actual restroom with soap and water and a water fountain. I'd like to come back someday and bike the parts that I haven't biked. I recommend. This is a great trail for biking, although there is not much in the way of scenery, at least on the parts that my spouse and I rode. One day we started at the Pamplin end and rode 6.5 miles before turning around and riding back. The trail appeared to be flat but on the return trip we found out that there was a slight incline riding east. There was really nothing to look at except trees on both sides with an occasional glimpse of cows in a field. A busy road parallels the trail for the first few miles and the traffic can be heard through the trees. The Pamplin end does not have a paved parking lot. There is a gravel area to park, and there is no fee charged there!! The 2nd day we started at River Road ($3.00 charge to park) and rode across the famous bridge and beyond for 9 miles, total 18 miles RT. Just after the bridge there is a Civil War encampment and there is something under construction next to the trail near there. A lot of heavy equipment was at work. Other than that, this section of the trail was the same: nothing but trees to look at for miles. We did not see a single other bike on the trail either day, and only a few walkers. It's probably busier on the weekend. It was worth the trip for the exercise and historical value. Early June my wife and I parked at the River Rd. parking lot and walked to the Bridge, it is definitely worth going to see. I liked the look of the trail so sat July 4th we spent the day myself on mountain bike and wife in chase vehicle, she dropped me off in Pamplin and met me every couple of miles to check on me. We met in Farmville for lunch which is a very good resting recharge area. I rode to a crossroad 8 miles from the end and aborted due to a storm. I can not wait to return and finish the trail! The scenery is mostly farmland and a couple small towns but a very enjoyable ride. An underrated and underutilized asset! I just finished "thru-hiking" the HBT from Pamplin City to just outside of Burkeville. I was really the only person I saw hiking as most everyone was on a bicycle. 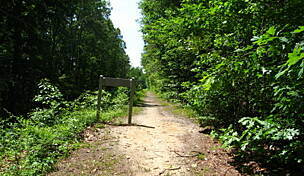 The trail is well suited for bikes, but it is also a great hiking route. I broke the trip up into two days. After being dropped off at Pamplin City, the first day was ~16 miles to Farmville where I stayed overnight at the Longwood B&B. Because there are no camp sites along the way (private land is adjacent to the trail), I decided on "glamping" in Farmville. 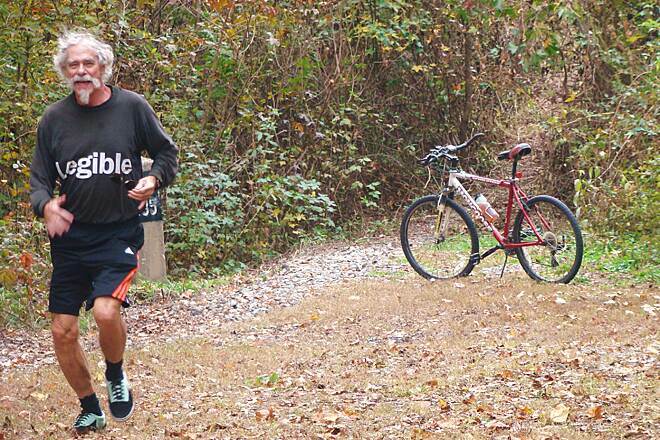 The next day I started early and completed the remaining ~15 miles where I was picked up just outside of Burkeville. There are restrooms (with TP) every ~3-4 miles or so, but no water so be sure to pack in more than what you need. The locals I met along the way were very nice and friendly. The trail is very humbling in that you can see 1/2 a mile ahead and behind at all times. In some sections you can see 1+ miles ahead and behind. When you can see that far and you are the only one there, it is quite the experience. Some sections are remote so be sure to bring a cell phone and keep track of where you are on the mileage markers. I was by myself for 75% of the time so it was a very peaceful and reflective hike for me. I saw 8-10 deer, turkeys and lots of rabbits. 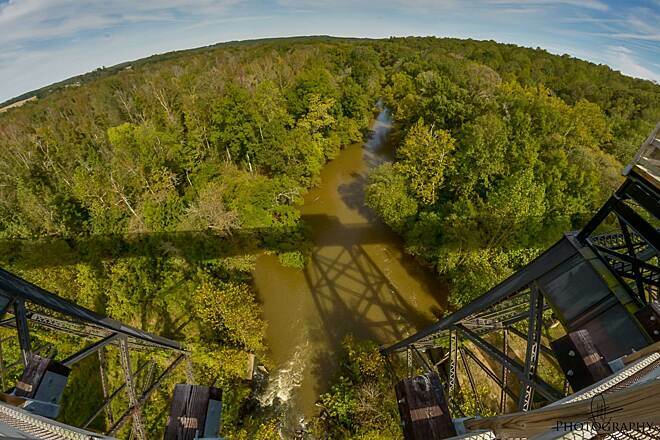 As many have said before, the bridge is definitely the "high point" (pun intended) of the trail. I was the only one on the bridge when I reached it so I had a great experience taking a break on a bench that is provided on the bridge. This trail has much greater potential. First off, the surface and distance is suitable for many running and bicycle race events. It should be used more to bring in out of town visitors who will spend money in the towns along the way. Sadly, the trail ends just outside of Burkeville. The town could benefit greatly by having an official start point in their limits. There is officially "no outlet" at the Burkeville end so I had to walk 50 yards through the woods in order to get picked up by my ride on 460E! This needs to be addressed in order for this section of the trail to be utilized more. Restaurants, bike shops, shuttle services and more could cater to the needs of trail users if this section of the trail was extended. Farmville did an excellent job of showcasing the trail and making sure their businesses benefit from the traffic associated with trail users. My wife and I did end to end and back about a week ago and the trail is in excellent condition. There are bathrooms well-placed, with toilet paper throughout the trail but there is no water. There are nice picnic benches for a break. The trail is flat but you can notice a difference in the grade at parts. 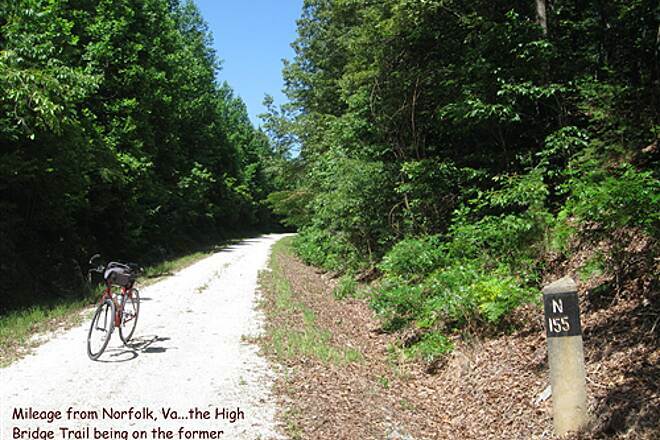 You will not find a lot of people on the trail except near Farmville. The town is a great halfway point for some food and time to relax. 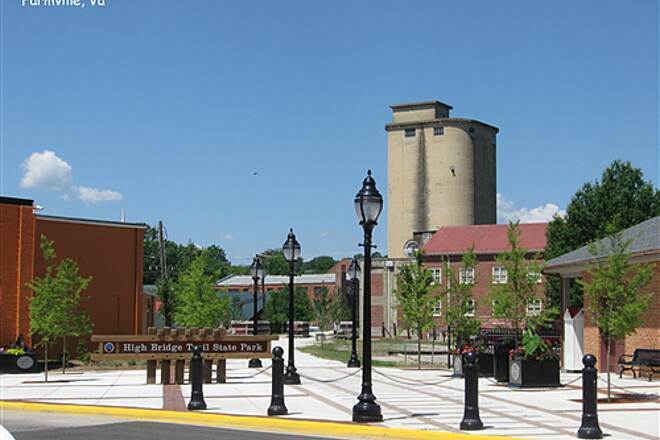 The high bridge is less than a mile from the town. Farmville has a bike shop next to the trail if you need something. We spent the night in Burkeville at the Comfort Inn before the return back. 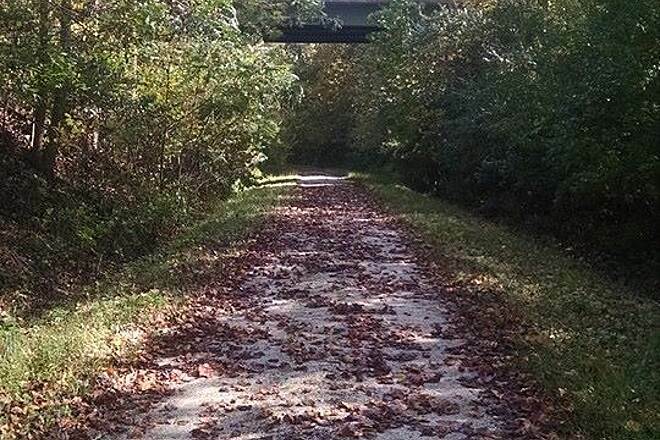 I would hope that the Commonwealth of Virginia will pay for the remainder of the trail to be completed to both Burkeville and Pamplin City, as it currently misses the towns by about a mile on each end. We went all the way to the end in Burkeville and found a way to cut over to the road—I suggest that if you want to go to the end. If you don’t do that , the last road is about a mile or more back. Overall a great trail—but just a bit lonely and not so much to see. We parked at Rice ($3.00 during the week) and rode 17 miles round trip to Farmville for a lovely lunch. This well planned trail is kept clean, has bathrooms and is very historic. The route is mostly straight and flat but the woods are pretty and the history is interesting. I'd recommend the Pamblin Civil War Museum if you are in the area. 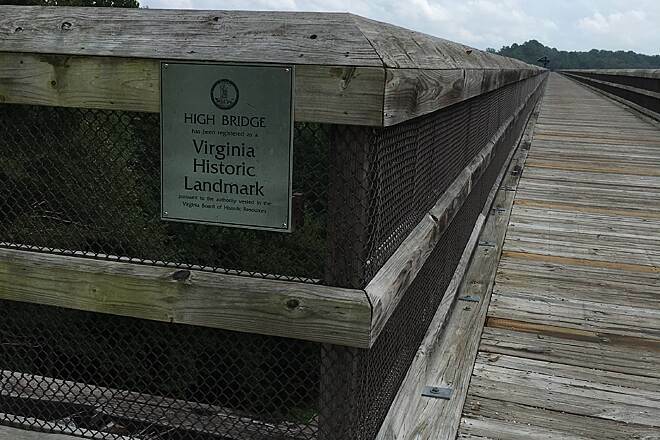 We went to High Bridge on 4/7/15 as a family. It was my husband, my 10 year old daughter and myself. We have only been riding on occasion for the past year, so we are definitely not pros. We parked in Rice and rode past the bridge and back. It was a beautiful ride. The trail it level and easy to ride on. Since it is level and there are inclines, there are no hills to go up, but that also means nonstop peddling. All and all, this place is beautiful and we will definitely be going back! (2) there had been a frost over the previous night and, when it started to thaw, the trail got wet. In most places this was no problem, but in many other places the surface became really sloggy and thick--like riding through wet cement. I burned a lot of un-necessary energy riding through these portions of the trail, some of them a mile long or longer. (3) that being said, the trail is flat and easily navigated. 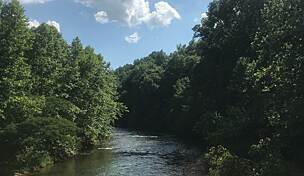 (4) if you want to get food or drinks along the trail, your best and essentially only option is Farmville; though I would mention that there is a rundown little convenience store near the Pamplin trailhead that has great sausage biscuits! Farmville is a very interesting little town and a fine spot to take an extended break from your ride. 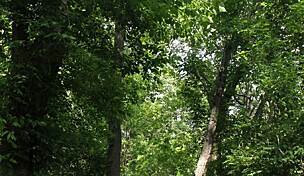 (5) if you need a place to stay, consider renting a cabin at Bear Creek Lake State Park. 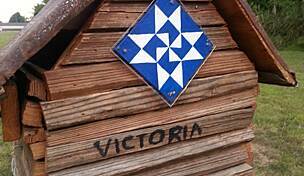 The cabins were fantastic, there's a swimming lake, and there are a couple of good multi-use trails in the nearby Cumberland State Forest. 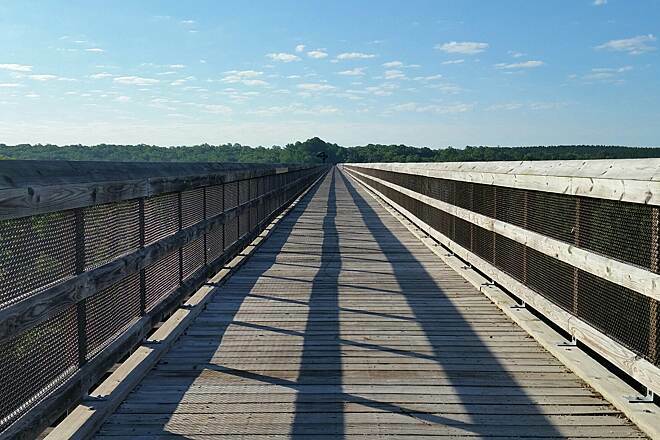 My wife and I biked this trail on November 21, 2014, when the temperature hit a high of 42 degrees. It was cooler than that on the trail. Still we had a good time. 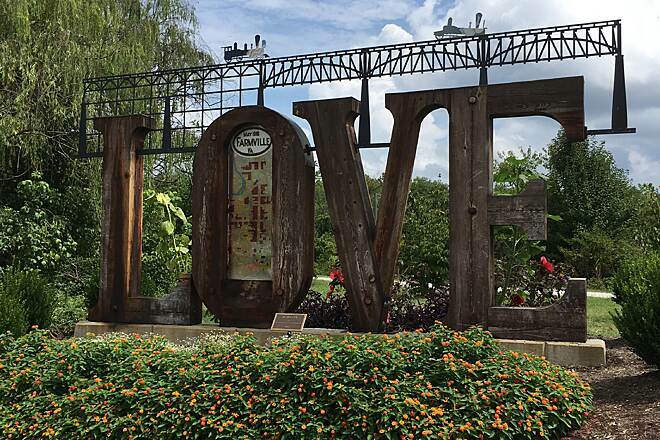 Farmville is the place to begin the trail as there are several places to get coffee, food, and lodging. The trail was well groomed. But a bit of freezing and thawing gave the trail some drag on the bike tires, which is crushed/packed stone. Of course, late November is not the time to do this trail. You do see the N posts showing the distance to Norfolk, VA. And, I did see two W signs indicating train engineers are supposed to blow their whistles. 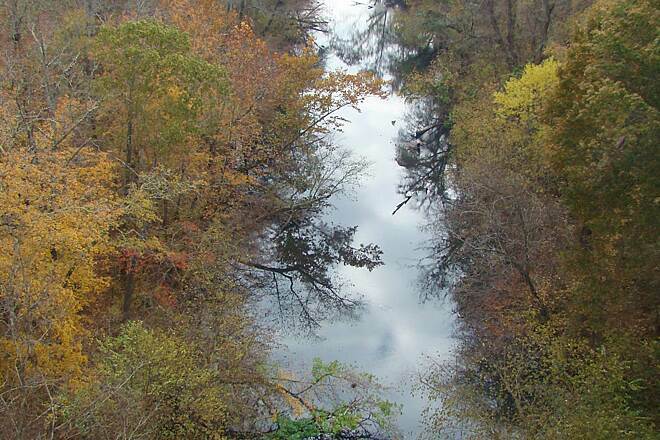 The view from the bridge is scenic. Would like to try it again during warmer temperatures. As noted in an earlier review, there is a charge for parking, as of October 2014 it's $4 per vehicle. The parking lot was very crowded and difficult to park. Once we parked, we were able to get on the trail quickly. Very crowded for the first mile. We parked at the lot nearest to the bridge. Walkers (we were biking)generally took up all 10 feet of the trail and most of the bridge. The bridge was nice and well kept. Very nice views. The trail itself after the bridge was nice and not crowded at that point either. There was a slight uphill grade but not a difficult level. We rode to the town of Rice and back to the bridge. Nice 10 mile ride. The thing to keep in mind is everyone wants to see the bridge, once you are past that part, it's a nice trail with nice woodland views. Farmville to Prospect - worth the trip! We made a return visit to the trail on 10/18/14. 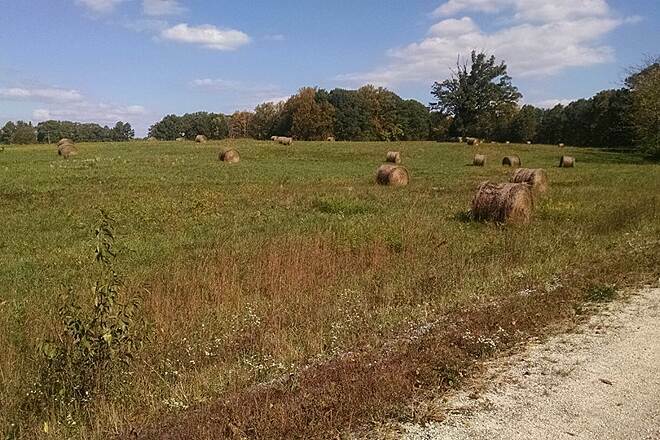 This time, we rode from Farmville to Prospect – a twenty mile round-trip. 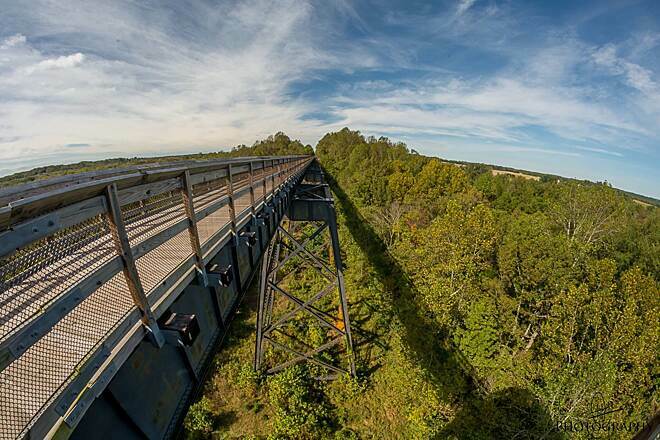 If you have only biked the High Bridge portion of the trail, I encourage you to see what awaits you on this section. We found this section to have more interest. 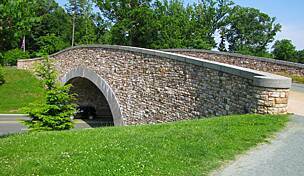 Bridges cross over the trail, rock formations were present, adjacent farms dotted with hay bales, and homes as you neared road crossings. Granted, if you need more action than scenic views, this trail is not for you. However, if you enjoy long stretches of tranquil scenery and the trail virtually all to yourself, you’ll enjoy this ride. The trail seems narrower than the bridge portion and offered more shade. Please note that the road crossings seem to happen in blind curves for motorists. The restrooms were clean and a welcome site. There are no trashcans, so you’ll need to take your picnic trash with you. Finally, this section of the trail had picnic tables available at intervals other than the trailheads. Great way to spend a day!! This trail has it all, well maintained surface, we witnessed park rangers pulling a drag matt behind an ATV, great bathrooms located along the trail, plenty of parking and nothing but scenery. 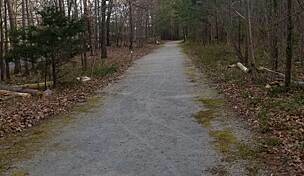 Due to this trail being a state park there is a $3.00 parking fee. Each lot has a yellow box where you get your pass, punch out the day of the week, hang it on your rearview mirror and place the three bucks in the envelope and put it in the slot. This is an awesome place to knock out some big miles over 60 for a round trip. The bridge speaks for itself, what is not stated is the grade. Farmville is the lowest point on the trail, when riding to the western end from Farmville you will have a net gain of 400ft in elevation but this translates into a 16.1 mile constant climb, great workout! 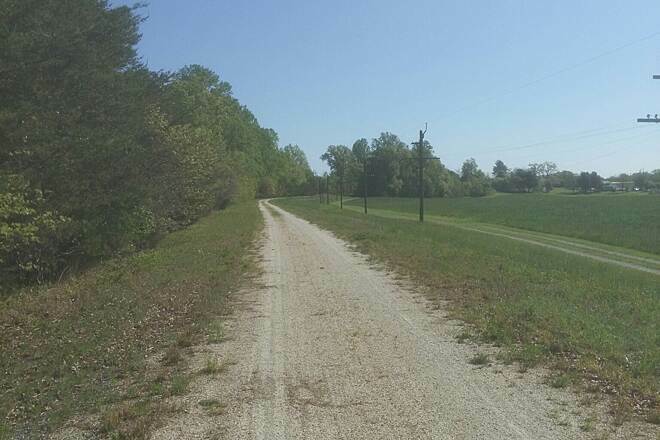 You will spend the majority of your time riding in the middle of nowhere, but that’s the great thing about this trail, it is the escape and that great feeling of you and your bike enjoying rural America. When riding through the small towns of Rice and Prospect it seems that time has been frozen. If you find yourself needing a snack or a cold drink in Prospect you can jump off the trail and head down towards 460 where you will find a convenience store that will get you fueled up for your ride back into town. From Farmville to the SE terminus the ride is a little bit flatter but you still have a steady climb to the 460 overpass in Rice. Rice to the end near Burkeville is a very nice ride; this is roughly an 8.6 mile ride to the end where you will find a picnic table to have a nice rest before heading back. 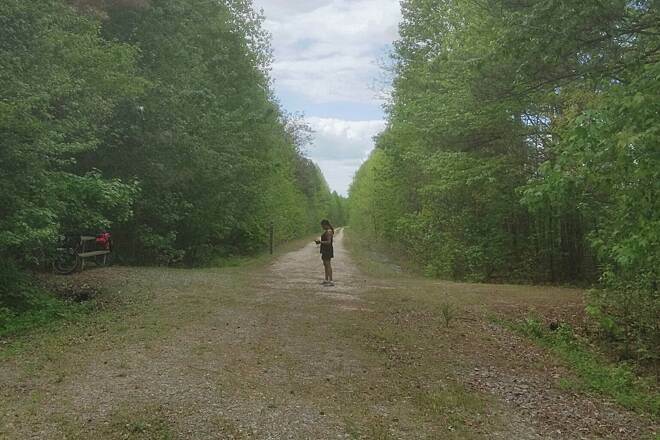 This is a great trail and I would highly recommend it to anyone looking for a good workout as well as spending quality time with your family and friends. I've ridden the entire length over several visits, all in 2013. I ride alone and on weekdays. Here's what you don't want: To be near either end on a weekday and have a problem. Chances are good you'll see no one. If you like that bit of adventure, as I do, you'll love it. I find the bridge worth the trip. And Farmville is quaint, but, my experience is, plan to park somewhere else. Coming down from Richmond, Rice makes a good entry point. All flat, all quiet, unshaded in summer sun, not for a hot day. Great trail for long distance rides! 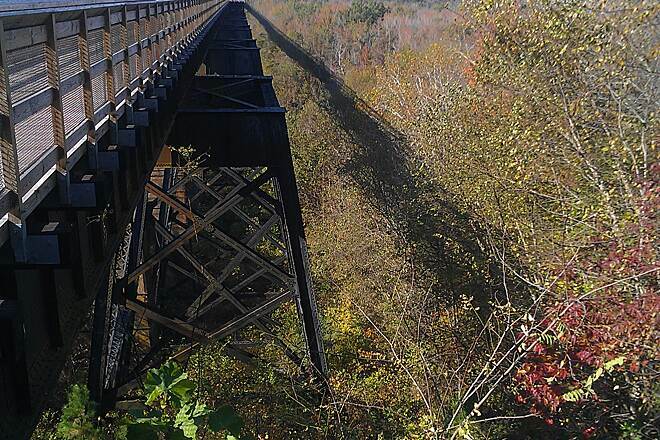 We rode the High Bridge Trail on 10/27/13. We started in Farmville and rode 2 miles past Rice and back (20 miles). The portion between Farmville and the High Bridge had the most “traffic” with the majority of that being the mile before the high bridge. After the bridge, the trail was quiet and serene. I trail seemed wider and the stone more firmly packed, which allowed us to pick up speed for long distances easily. The Rice trailhead had restrooms, parking, and a bench and was a good place for a break. You are very close to Rt. 460 at that point, so you can hear the traffic as you ride. Our bike computer told us we climbed 1100 ft in elevation, but we never had to adjust our gears for this ride! There are signs along the trail telling cyclists to yield to pedestrians and horses. We saw no horses that day (only evidence of horses). 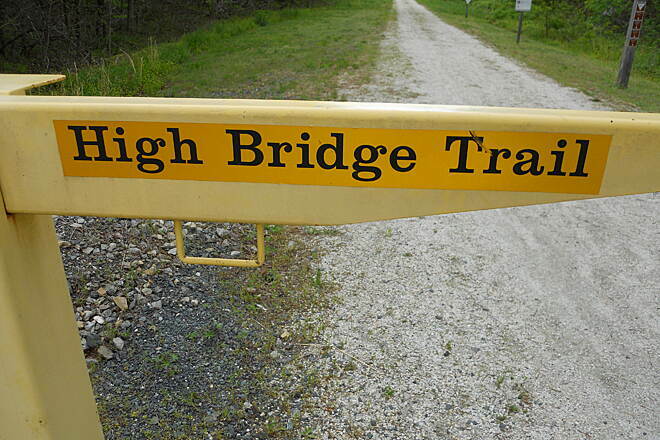 We found the High Bridge area to be the most difficult part of the trail. Although we are to yield to pedestrians, there is not any signage telling users to keep right and cyclists to pass on the left. We encountered many people who took up the entire trail walking to the bridge (couples and large groups). Since people bring their pets with them, we had to deal with dogs reaching for us on their leashes as we tried to go around. Often, we had to ride on the grass – even when stating “passing on the left”. 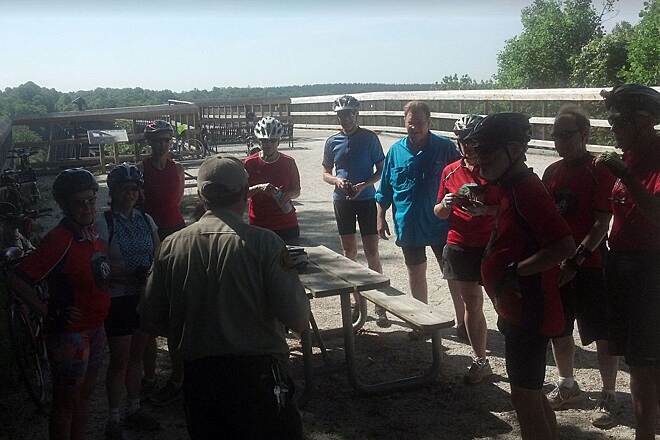 So, if you plan to ride this part of the trail, know that will be part of the experience. Overall, I am excited to return and try out the other sections of this beautiful and peaceful trail! Rode this trail yesterday from end to end, and as others have said, it's pretty boring. The bridge is the main attraction, and to be honest, it's nothing special. Sure, it's long and it's high, but that's it. There isn't even a good vantage point to see the bridge from the side. 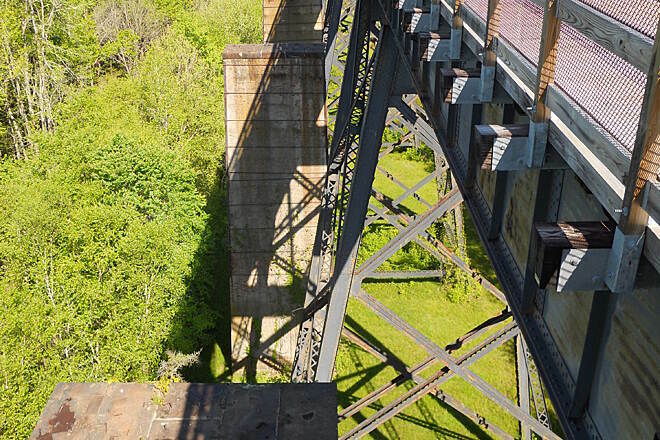 Unlike the Virginia Creeper trail or the New River trail with beautiful scenery and mountain vistas, the High Bridge trail is pretty much mile after mile of trees on both sides of the trail. The trail surface was very smooth and nice to ride on. Charlies in Farmville is a nice place to stop and have lunch. It's a hundred yards or so off of where the trail crosses Main St. Drove from the Richmond area to FarmVille to ride the trail. Was a nice easy trail which was pretty flat. 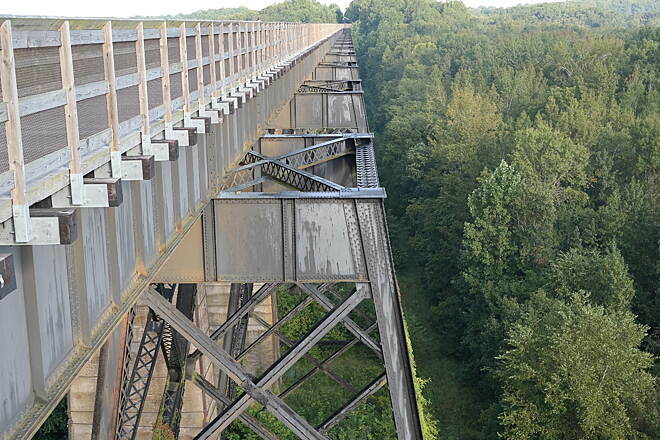 The High Bridge is worth seeing and other than that there is not much else to see. We rode from MM 150-135 and back. There are numerous bathrooms along the route so no worries. Enjoy! We rode this trail a couple of weekend ago. 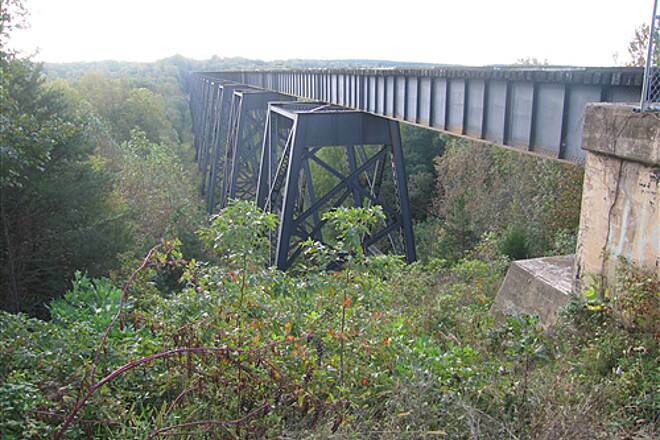 The section we rode was from Farmville riding east, over the High Bridge, to Rice, and then back to Farmville. Overall length was a little over 16 miles. The high point of the ride was High Bridge. 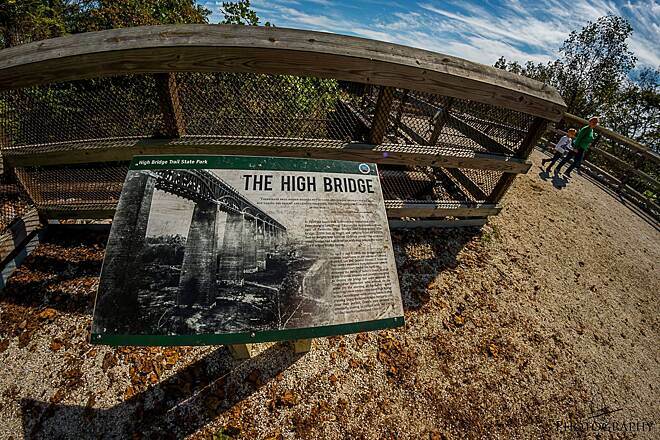 High Bridge is about ½ mile long and is 125’ high at its highest point, crossing over the Appomattox River. 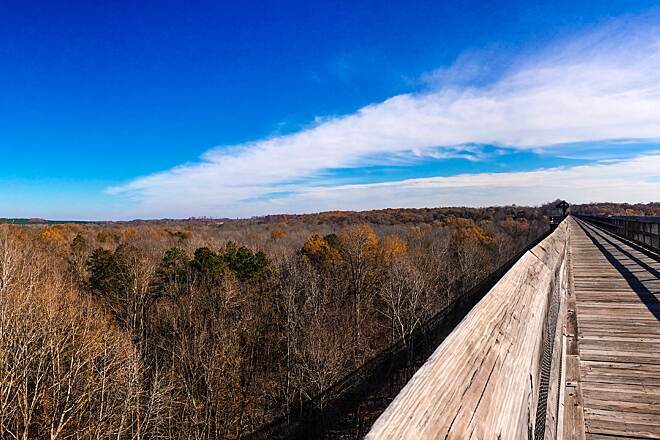 The views from High Bridge are incredible. Other than the bridge the ride is a nice, level gravel trail that is flanked by trees and occasional rock walls on both sides. It is a very easy, level, pleasant ride, but can get a little boring (given the lack of changing scenery). Overall, we really enjoyed this ride and we would recommend it to anyone looking for a casual ride in a nice area of Virginia. Good surface. The bridge is nice. Utterly boring due to lack of scenery. Save your money for the New River and the Creeper. I thought Greenbrier River Trail was a little lackluster scenery-wise but High Bridge beats it hands down. My friend and I did most of the trail Memorial Day weekend 2012. All of that being said we do intend to swing back by on the way to Greenbrier to finish this trail. 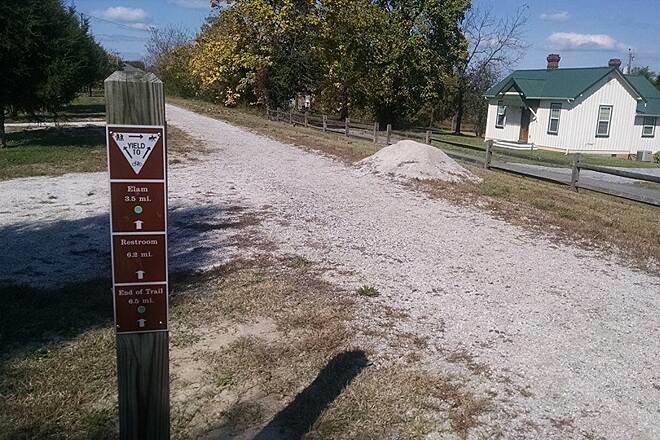 The map and description of the Burkeville Trailhead are misleading. 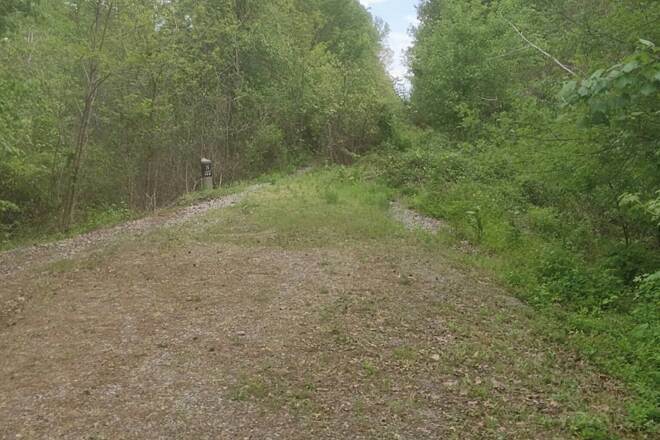 The railroad is still active in Burkeville! The last actual access to the trail on the Burkeville end is at County Road 607 aka Orchard Road. It is well marked on nearby US 460 and there is a small parking lot. Maintainence beyond that point seems to be less of a priority than that in the Farmville direction. Since most of the trail traffic seems to originate from other than the Burkeville end, this doesn't seem like a big deal. Rest rooms are well-maintained, although maintained wells would be welcome. 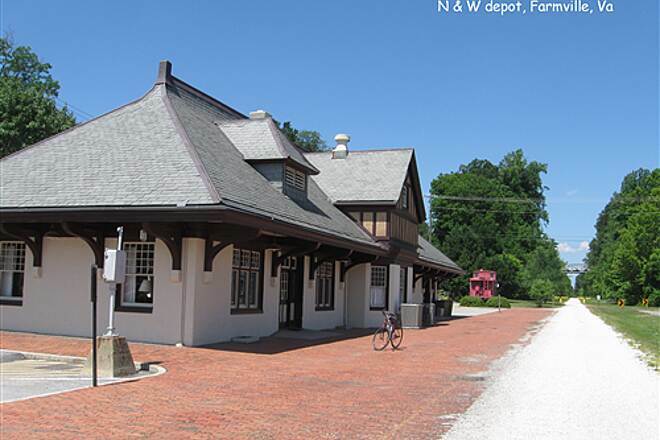 The structures remaining at Prospect and Rice give you a feel for what it was like on the N & W mainline and Farmville offers a fine assortment of railroad-served industries. 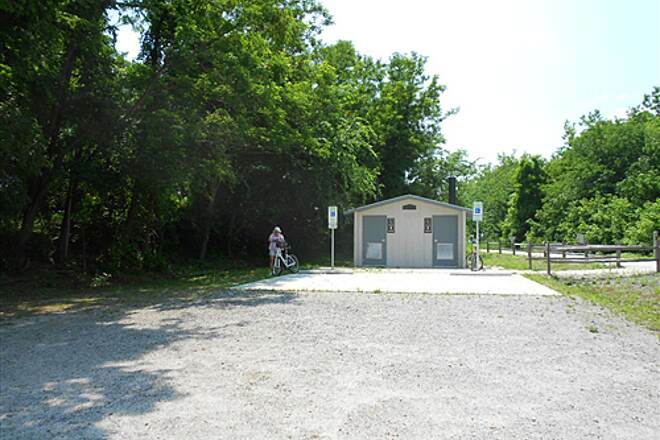 The town also has nice trailhead facilitiers and opportunities for a break. Try to visit Walker's Diner, adjacent to the trail... this tiny traditional establishment has only counter stools. The truth remains, as stated in other reviews... this trail isn't named what it is by mistake !!! 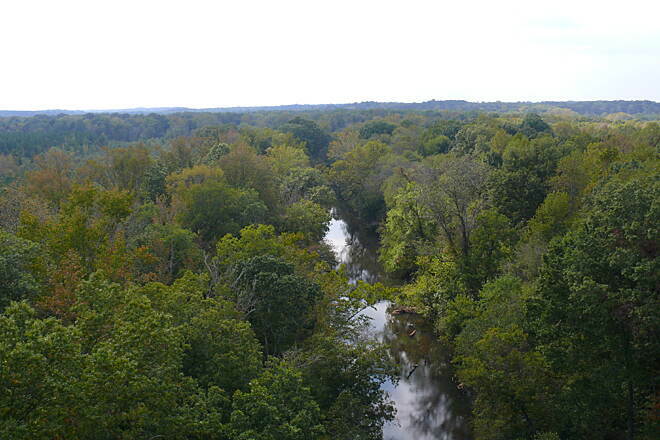 We biked the section of the trail between Rice and River Road, which crosses the High Bridge. The weather was pleasant, which made the ride pleasant as well. Some notes for others. 1. Like most former railroad trails, this one is relatively flat and straight. This is nice for younger kids, but gets a little monotonous for adults and older children. 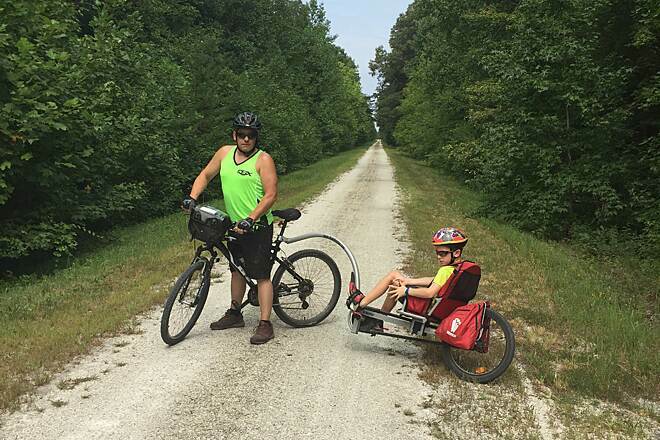 By comparison with an 11-mile ride we took in the fall on the New River Trail, this one was flatter and sunnier, and generally easier for the younger children. 2. 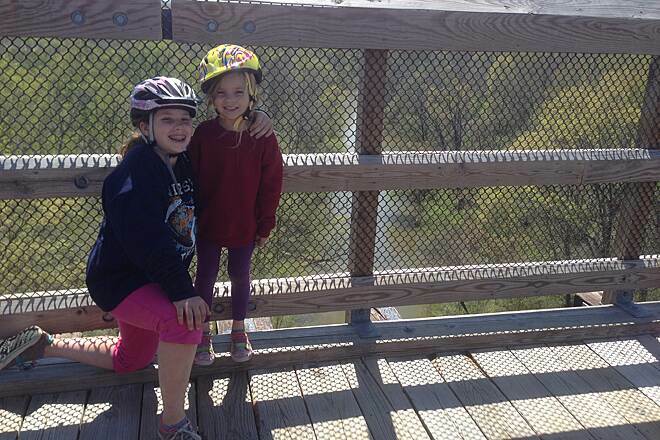 Our 6-year-old and 8-year-old daughters handled the 9-mile roundtrip ride just fine. Neither need training wheels on their bikes any more, and the little one was a bit tired by the end of the trip, but not exhausted. 3. There is not much overhanging vegetation, which means that much of the trail will be in full sun during the summer. If you're planning a day trip in the summer, bring lots of water and sunscreen. Our ride from Rice, over and past the bridge, to River Road, and back took us about 2 hours 15 minutes with frequent stops for the 6-year-old to rest and drink water. It was very pleasant on a sunny 65-degree day. 4. The bridge is wonderful. 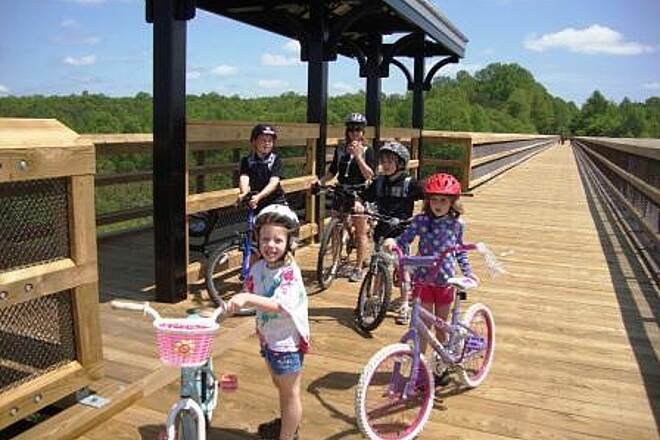 The modification for foot/bike/horse traffic is great, and the kids really enjoyed riding their bikes on the old railroad bridge. The benches on the bridge are beautiful, and the whole project is nicely done. 5. If you're looking for the closest access and shortest round-trip, go to the River Road entrance. The parking lot there was crowded, but it was only about 1 mile from there to the bridge. A hike or walk from River Road would be pleasant. 6. 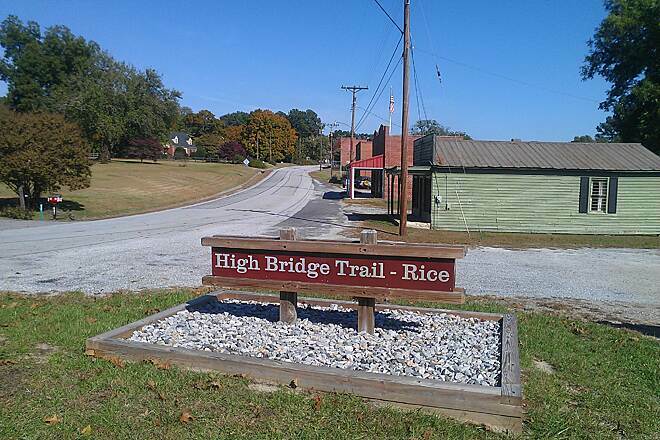 If you can handle a little longer ride, the Rice entrance was deserted and is only about 3 miles from the bridge. I would not hike from the Rice entrance (long, flat, somewhat monotonous), but I'll bet that it would make a nice circuit for a 6-mile run. My 3-star rating compares this with the New River Trail State Park, which is a very pleasant trail ride. Because of the lack of shade in much of the trail and the somewhat monotonous scenery, this is only an average trail. It is a pleasant place to ride bikes with younger kids on a nice day and is certainly worth the trip if that is your situation. 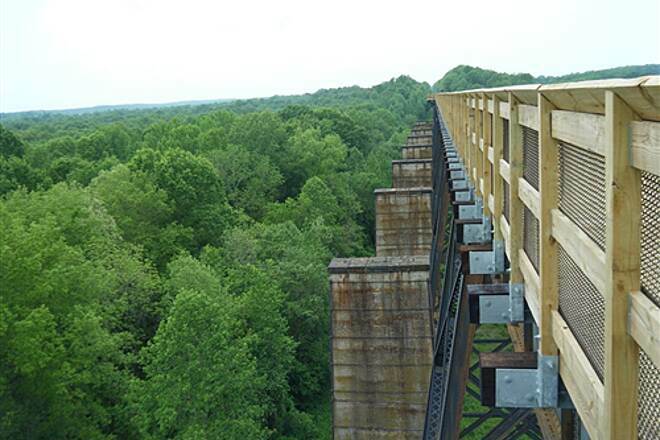 The High Bridge, located about 4 miles east of Farmville, was opened in April 2012. 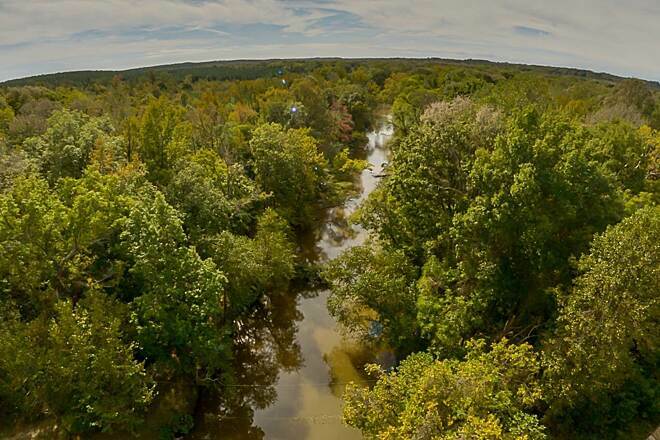 It's nearly a half mile long and is about 125 feet above the Appomattox River and its surrounding floodplain. 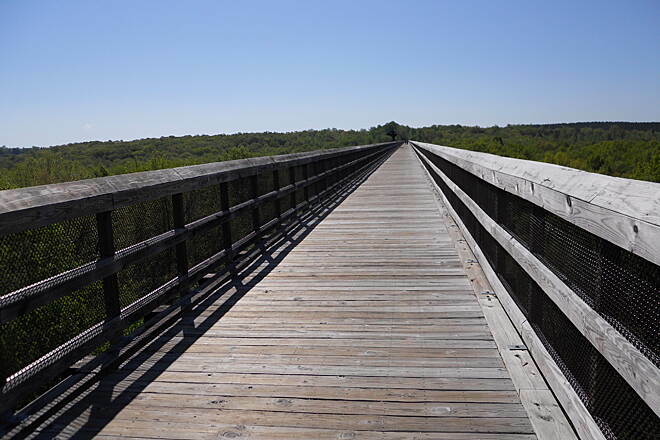 It has a wooden decking constructed on top of the steel trestle, with several observation areas along the way for taking in the scenery without obstructing other cyclists. 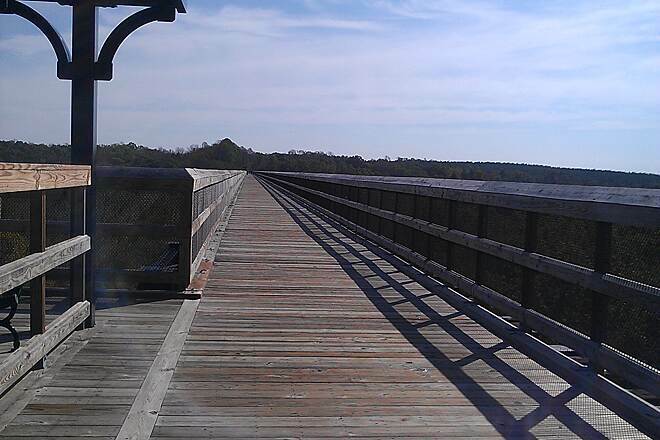 I pedaled from Farmville down to the bridge and beyond to the trailhead near Burkeville and back. As another reviewer noted, most of the trail is lined by trees on both sides, so it's not particularly scenic other than the general greenery. But the bridge more than makes up for that! There are restrooms every few miles but bring plenty of water as there's none on the trail. First... It's very, very nice that this is being done. Thanks to all involved. However, my title about says it all. I did this a couple of weeks ago starting in Farmville. Rode up to Prospect and back then had lunch in Farmville. 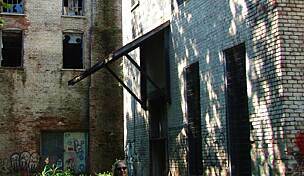 Took the trail to the maintenance entrance to the High Bridge and back. The whole way is just trees. Not really much to view except a few fields. If your looking for solitude only then this is it but I'll wait until the bridge is open to go back. Lots of history and a serene, pretty place to ride. When the High Bridge portion is opened, that will really be something special. As it is, you can ride up to the bridge, but not over. The trail now runs 7 miles west of Prospect. It's a very nice, easy-to-bike trail. The High Bridge is spectacular. 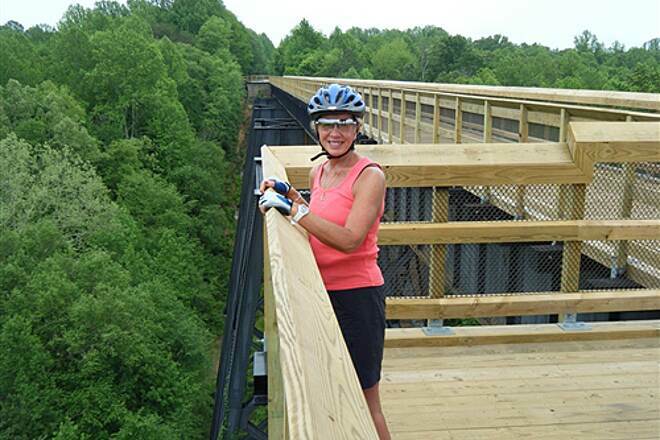 I can not wait until the trail is completed over the bridge and the entire 34 miles are open. 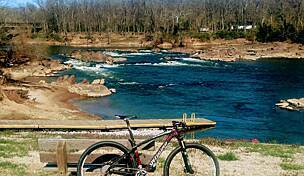 It will rival the Virginia Creeper and New River Trails as quality rides. Very good firm surface. On several of the western sections the bushes along the trail are encroaching onto the edges of surface, but it is nothing two passes with a mower wouldn't cure. Parking areas are large, well maintained and well-spaced. 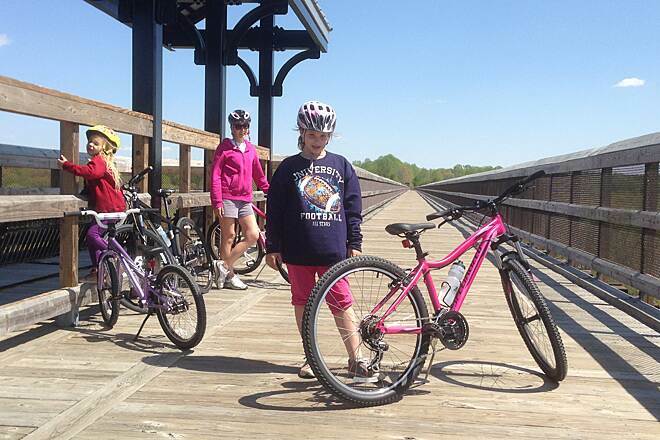 The miles in Farmville are well used with walkers and bikers. On the sections away from town we had the trail to ourselves on a Monday in September. While we did not see any horses we did see some evidence that horses had been there. It is a good trail for families. There is only one major road crossing in the middle of Farmville along with several rural road crossings. Bring a trail map since there is little in the way of navigational signs. While there are porta-potties scatter along the trail near the parking areas there is no access to water without leaving the trail. The state of Virginia is doing a good job developing this linear state park. When completed it has the potential of being a very enjoyable and educational ride.